1963 was the year that The Big Ape’s Banana Chew went on the market. This was “the gum that makes you go Ape!” Bradford B. Jacobs had acquired a Korean bamboo factory in some shady dealing that he paid the government a lot of money not to look into. He converted it into a gum factory and, despite the gum tasting not a bit like banana and quite a bit like bamboo, quickly expanded into two, then three then twelve factories. During the Korean War Bradford made a few investments in Korea, betting on a quick victory. It didn’t come out until the 1990s, but it turned out that Mr. Jacobs had invested quite heavily in the Korean War effort. The North Korean effort, that is. Despite being a self-proclaimed patriot and after claiming for years that he was a direct descendant of Martha Washington, Mr. Jacobs pumped a lot of money into the North Korean economy. But it must be stressed that Mr. Jacobs was not anti-American, he was pro-making money wherever he thought he could. Big Ape Banana Chew was followed by many more candy products by Bradco Confectionary Industries, as Bradford’s candy-making company was dubbed. Chocolate Big Ape paws, Mint Ape Bits, and his biggest seller, Furry Cocoanut Big Ape Balls all debuted in short order. Bradford, by 1965 wanted to move into gourmet food. Thus, Big Ape bouillabaisse, Big Ape truffles, Big Ape steak tartar, and Big Ape fugu all were featured on the menu of Bradford’s Big Ape Steak House, a chain of 198 restaurants all across the eastern seaboard. 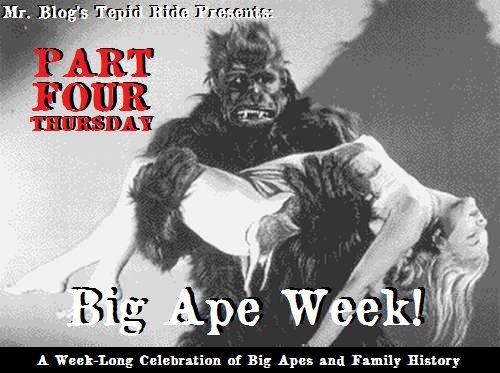 1968 also saw the first significant addition to the Big Ape world in decades: Li’l Big Ape. MGM released Son of The Big Ape Part Two, a sequel to Son of The Big Ape. This does not feature the same son. Tragically, The Big Ape’s first born died in 1956 while rescuing Napoleon from a volcano in a time-travel epic. This Ape-son was much cuter, much smaller, and much easier to market. Dubbed The Li’l Big Ape, this new simian smash would rival his father in the sheer amount of products produced bearing his image. This new character was aimed squarely at the toddler set, and no baby would be seen in public without The Li’l Big Ape on the back of his diaper. In the 1960s, The Big Ape would change with the times, sometimes radically, sometimes from film to film. 1961- Big Apes on the Moon pre-dated the moon landing by several years. In this film, The Big Ape was the first Mexican astronaut sent to the moon. 1962- The Big Ape Meets El Presidente pitted The Big Ape against Castro. 1962- The Big Ape Defeats the Imperialists pitted a Cuban Big Ape against American forces in Havana. 1969- The Big Ape Steps on Hippies is self-explanatory. 1969 was also the year that Alfred Hitchcock (yes, that Hitchcock) remade his classic film Vertigo as Big Ape Vertigo, a faithful remake featuring Cary Grant as The Big Ape. Well, you see, everyone just had to make one. No director worth his salt could lay a claim to greatness without at least one Big Ape epic to his name. The question, really, has been why I choose to remake Vertigo. Simply put, I had always viewed that as a flawed film. Despite a cast of talented stars, and a script worthy of them, I had always harbored a secret desire to remake it with The Big Ape. On retrospect, I should simply have made it with The Ape the first time. There were novels, stage plays, television dramas, and products available everywhere featuring The Big Ape. Bradford B. Jacobs continued to make fortunes unimaginable. He bought houses in all major cities, tried to buy major cities, and became a star himself with his weekly commentary “These Things I Believe” every Wednesday on the CBS Evening News. Bradford had a minor health scare when an actor in a Big Ape suit attempted to climb a flagpole for Bradford’s birthday. The actor’s Big Ape paws didn’t grip the pole very well and he fell on Bradford, breaking the entrepreneur’s left arm. Major networks broke into their regular programming to cover this story. It was after this event that Big Ape first-aid kits hit the market. Obviously, everything Bradford B. Jacobs touched turned to gold. Furry Big Ape gold. TO BE CONTINUED IN PART FIVE- NIXON MEETS THE BIG APE, THE 1970s. Perhaps you could clear up a few questions. Is there any truth to the rumor that Brian Epstein had to beg Lennon and McCartney to change the names of some of their songs? I heard there was one originally called I Want To Hold Your Paw, not to mention the Big Ape’s Lonely Hearts Club Band. Also, I think your readers are entitled to the real story behind the credible sightings of the Big Ape on the grassy knoll. Brian Epstein, as history has shown, was the dumbest man in music. He forced Lennon and McCartney to change the group’s name from The Aples, he made them redo the lyrics of “Elenor Big Ape,” and worse, he introduced John to Yoko. As for the grassy knoll, I think Oliver Stone cleared that up in Big Ape JFK. Tomorow’s conclusion has some of Great-grandpa Bradford’s missteps, and his tragic end. Not a direct descendent of GEORGE Washington, interestingly. Oh, you’re thinking of THAT Martha Washington.